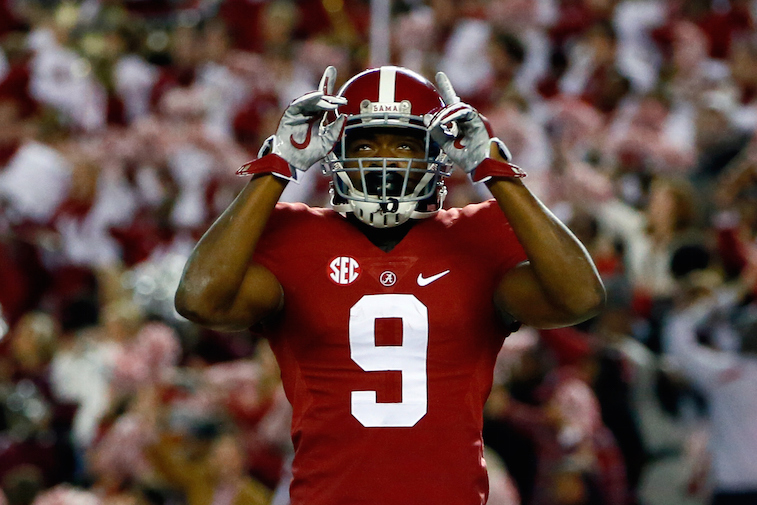 The 2015 NFL Draft class is ridiculously deep at the wide receiver position. In fact, the position is so rich with talent that as many as seven or eight wideouts could be taken during the first round of the Draft on April 30. 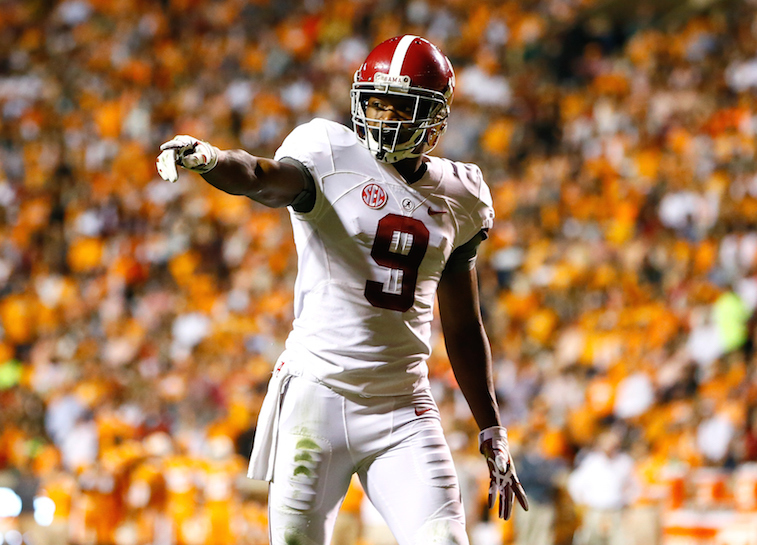 Leading the way are former Alabama All-American Amari Cooper and former West Virginia All-American Kevin White. Both players are projected to go in the top half of the first round, and both players have the kind of ability that could make them legitimate Rookie of the Year candidates for the 2015 season. Cooper stands 6-foot-1, weighs 211 pounds, and is the reigning Fred Biletnikoff award winner. He re-wrote the receiving record book at Alabama during his three seasons in Tuscaloosa, and turned in one of the greatest single seasons by a wide receiver in SEC history during his final year of college football. In 2014, Cooper played in 14 games and caught 124 passes for 1,727 yards and 16 touchdowns. His record-breaking production last season did far more than simply help him bring home the Biletnikoff award. Cooper was also unanimously voted a consensus All-American, won the SEC Offensive Player of the Year award, and finished third in the Heisman Trophy voting. Just like Cooper, White had an All-American caliber year in 2014. Unlike Cooper, White wasn’t an instant college star. He attended Lackawanna College for two years before transferring to West Virginia for the final two years of his career. His first season as a Mountaineer was less than enthralling, but he did flash signs of being an explosive playmaker. In 2014, the 6-foot-3, 215-pounder caught 109 passes for 1,447 yards and 10 touchdowns in West Virginia’s spread offense. For his efforts, he was named a first-team All-American by two of the five major publications and was one of three finalists for the Biletnikoff Award. Heading into the NFL Combine, Cooper was the clear-cut favorite to be the first wide receiver to hear his name called during the first round of the 2015 NFL Draft. That was until White turned in one of the best all-around performances of any player in attendance at the prestigious event. Now, the two explosive pass catchers are more of a No. 1A and a No. 1B, rather than No. 1 and No. 2, in most experts’ 2015 wide receiver draft rankings. Furthermore, it appears as though White may have jumped Cooper as the top wide receiver prospect in this year’s class on several people’s draft boards. We’re here to tell you why it would be foolish for a team to pick White over Cooper in the upcoming Draft. NFL scouts, general managers, and coaches all have an almost insane tendency to fall in love with freakishly athletic draft prospects. This phenomenon is otherwise known as the Mike Mamula Effect. For those who don’t remember, Mamula was a solid, not great, draft prospect coming out of Boston College. He would go on to have one of the greatest combine performances of all-time, and as a result, Mamula was selected with the seventh overall pick in the 1995 NFL Draft. His story remains as a cautionary tale every time a player turns in a similarly dominant performance at any scouting event. 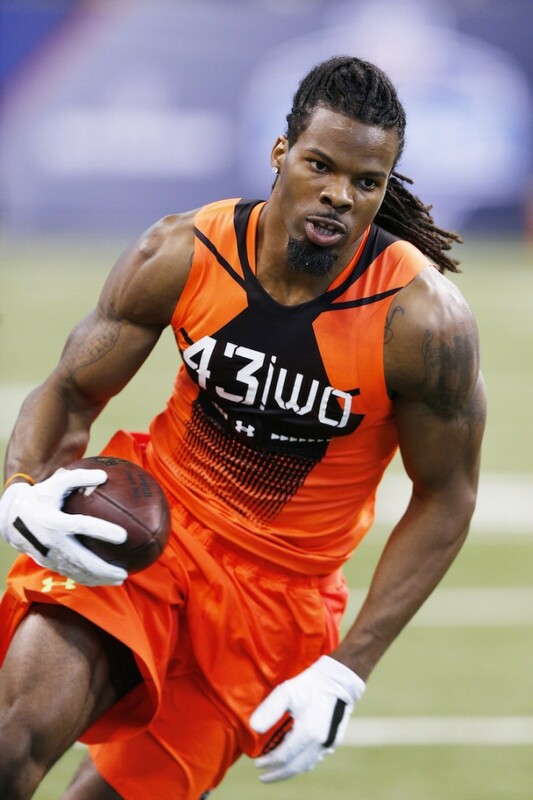 Before we go any further, lets be clear that we are not, in any way, saying that Kevin White (pictured above) is the next Mike Mamula. White is widely being credited as being the top-performing wide receiver at the Combine in February. After further examination, he really wasn’t that much better than Cooper during the physical testing portion of the event. Here is a snapshot of each how both players performed in each test at the 2015 Combine. As you can see, White did outperform Copper at the NFL Combine, but not by much. In fact, if you watch the simulcast of their 40-yard dash videos, it looks like the two players were even closer than their official times would suggest. Now that we’ve taken a look at the overall athleticism of both players in shorts and a t-shirt, lets move on to how they compare as football players with their pads on. Cooper is about as polished of a wide receiver as you will ever find coming out of college. He has an elite combination of size, route running ability, agility, and top end speed that make him as close to a sure thing as there is in the 2015 Draft. On top of that he has a tireless work ethic, is a model citizen, and has an incredibly high football IQ. It is also important to note that Cooper absolutely tore up the SEC – the toughest conference in America — for three years and with two different quarterbacks. White has game-changing ability, but lacks the fine-tuning that makes Cooper stand out among the other wide receivers in this draft class. He may have more raw potential than any other player available at his position, but White will need at least one year in an NFL system before he is a dominant wide receiver at the NFL level. He played in a spread offense at West Virginia that relied heavily on wide receiver screen passes more so than down field routes. As a result his experience as a route runner is simply not where it needs to be at this point. There is no denying White’s explosive ability, but he remains a major work in progress. When Draft Day arrives, teams in need of help at wide receiver will have to weigh the risk versus the reward when making the decision between Amari Cooper and Kevin White. The safe pick is Cooper, the risky pick is White. When it comes down to it, is it really worth passing on a near sure thing in Cooper for a raw, physical specimen like White? Probably not.